Paul Worsfold is Professor of Analytical Chemistry in the School of Geography, Earth and Environmental Sciences at the University of Plymouth. He obtained his BSc at Loughborough University of Technology in 1976 and his PhD in Analytical Chemistry at the University of Toronto in 1980. This was followed by positions at the Technical University of Denmark, Sheffield City Polytechnic and the University of Hull. He was awarded a DSc in 1998, was President of the RSC Analytical Division (2004-06), a Governor of IGER (BBSRC research institute; 2000-06), chair of the Division of Analytical Chemistry of EuCheMS (2011-2016) and Editor of the journal Analytica Chimica Acta (1990-2018). He has received the Royal Society of Chemistry SAC Silver Medal, the Society of Chemical Industry H.E. Armstrong Endowed Lectureship, the C.B. Huggins Endowed Lectureship from Acadia University, Canada, the Royal Society of Chemistry Theophilus Redwood Endowed Lectureship and the Japanese Association for Flow Injection Analysis Honour Award. Professor Worsfold has more than 370 publications including nearly 250 original research papers and supervised 61 PhD completions. His research interests are in the broad areas of Analytical Chemistry and Environmental Chemistry. Specific themes include flow injection analysis (FIA), techniques for the determination of phosphorus and trace metal species in natural waters and the design and deployment of instrumentation for studying environmental processes and biogeochemical cycles. Alan Townshend holds B.Sc., Ph.D.and D.Sc degrees from the University of Birmingham, where he lectured in analytical chemistry from 1964 to 1980. He moved to the University of Hull in 1980, where he introduced both analytical chemistry and toxicology as degree subjects. He became Professor of Analytical Chemistry in 1984 and later held the G. F. Grant Chair of Chemistry and served as Dean. He became Director of the institute for Chemistry in Industry in c.2000 and retired from the University in 2004. He has published five books and edited numerous others. He has also published more than 300 scientific papers, his main interests initially being flame spectroscopy and, from about 1978 onwards, analytical applications of chemiluminescence and of immobilised reagents (especially enzymes), and flow injection analysis. 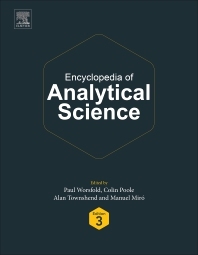 Professor Townshend was a senior editor of Analytica Chimica Acta (Elsevier) until 2006 and of the Dictionary of Analytical Reagents (Chapman and Hall, 1993). He has been an Editor of all three editions of the Encyclopedia of Analytical Science. He was President of the Analytical Division of the Royal Society of Chemistry (RSC) in 1996-98 and has served on several of its committees. He was an active member of the Analytical Chemistry Division of the International Union of Pure and Applied Chemistry for many years. He also was a member of the Council of the Analytical Chemistry Division of the Federation of European Chemical Societies for four years. His interests in forensic science and toxicology led to appointments to bodies governing the competence of forensic scientists and the verification of anti-doping tests in horse racing. He also served on the Chemistry panels of the Higher Education Council’s Research Assessment and Teaching Quality exercises. After retirement, Emeritus Professor Townshend successfully completed a part-time BA course in Archaeology (2006 – 13) at the University of Hull. He is now involved in genealogy with help from the University of the Third Age (U3A) and also organises wine appreciation meetings for the local U3A branch. Prof. Colin F. Poole was born and educated in the United Kingdom receiving a B.Sc. in Chemistry from the University of Leeds (1971) followed by graduate studies at the University of Bristol, MSc. in analytical chemistry (1972), and Ph.D. with Prof. E. D. Morgan at the University of Keele (1975) on the analysis of insect moulting hormones. Since 1980 he has been at the Department of Chemistry, Wayne State University, Detroit, Michigan, USA , except for 1995-1996, spent as the Governors’ Lecturer and Professor of Analytical Chemistry at Imperial College of Science, Technology & Medicine, London, in the United Kingdom. He is a former Science Advisor to the US Food and Drug Administration, a position he occupied for 25 years. Professor Poole has broad interests in the separation and detection of small molecules in biological, environmental, and food samples using a range of sample preparation, chromatographic and data analysis tools. He is the co-author of over 400 papers, 20 books, an editor of Journal of Chromatography A and a member of the editorial boards of 5 other analytical chemistry journals. .
Dr. Manuel Miró received his M.Sc. (1998) and Ph.D. (2002) in Chemistry at the University of the Balearic Islands, Spain. He has conducted post-doctoral research in several universities including the Technical University of Berlin, Technical University of Denmark and University of Natural Resources and Applied Life Sciences in Austria. He is currently Full Professor in Analytical Chemistry (from September 2017) at the University of the Balearic Islands; Visiting Professor at Charles University (Czech Republic); and member of the IUPAC Chemistry and Environment Division (Subcommittee on Chemical and Biophysical Processes in the Environment). He is the Reviews Editor of the journal Analytica Chimica Acta (Elsevier, IF:4.950, second highest IF across general journals in Analytical Chemistry) and Associate Editor of the Enclyclopedia of Analytical Science, 3rd Edition, Elsevier, since 2007 and 2016, respectively. His publication record shows over 170 refereed articles including 11 book chapters, with an h-index of 35 and over 3500 citations. He has published 19 articles in Analytical Chemistry from ACS and is corresponding author of over 90 articles.He has delivered over 55 oral presentations (43 as Keynote or invited lecturer) in international conferences on analytical chemistry, sample preparation, nanotechnology, environmental chemistry, and automation based on flow methodology. He has presented over 130 poster communications in international conferences and symposiums. He has supervised 7 PhD students in national and international universities (Technical University of Denmark, Mahidol University in Thailand, University of the Balearic Islands and Universidade Federal de Bahia in Brasil). He has been actively engaged in 27 national and international research projects (e.g., University of Melbourne and Charles University in Czech Republic) 15 of which as the Principal Investigator. His research interests are focused on the development of on-line sample processing strategies for isolation and/or preconcentration of trace levels of environmental pollutants exploiting the various generations of flow analysis, including Lab-on-a-Valve platforms and 3-D printed fluidic structures, in hyphenation with modern analytical instrumentation.